There are three basic money management systems that couples use: pooling, partial pooling, and independent. Those are the academic terms – I prefer to refer to them as joint, partly joint and partly separate, and separate. In this post I have visualizations of each of these money management styles, plus a variation of joint that I call joint with allowances. The main distinctions among the styles are into what type of account (joint or individual) the couple’s paychecks go and whether or not there is any individual discretionary money. Joint money management: All income goes into a common account and all expenses are paid from it. Joint with allowances money management: All income goes into a common account that pays nearly all expenses, but each spouse gets a certain amount of money for his own discretionary spending. This bit of separate money may go into an individual account or it may just be earmarked within the joint account. 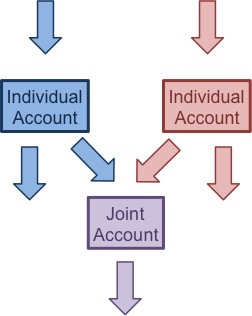 Partly joint and partly separate money management: Individual incomes go into separate checking accounts and then some portion of those incomes are transferred to a joint account. Some couples contribute equal amounts of money to the joint account, some contribution equal percentages of their incomes, or they may come to some other arrangement. Joint expenses are paid from the joint account and individual expenses from the individual accounts. Separate money management: Income and expenses stay completely separate; there is no joint money. As you can imagine, the pros of one type of account correspond to the cons of other types. Basically, you just have different degrees of unity and autonomy. With more joint types of accounts you must be on the same page with your spouse regarding how all of your money is spent and that may be a source of conflict. With more separate types of accounts you are able to make decisions about at least some of your money independent of your spouse, but that may just paper over differences between you two and result in discontinuity. Joint money management and separate money management are the easiest to set up but likely more difficult to maintain. Joint money management requires making a joint budget and agreeing on all purchases, which will necessitate continual negotiation between the spouses. With separate money management you aren’t forced to interact much which means you have to be self-motivated to check in with one another regularly if you are planning on a future together. 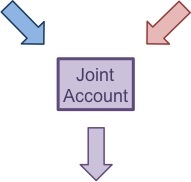 The difficulty in setting up a joint with allowances or partly joint and partly separate is in determining 1) what expenses will be covered by the joint account and what will be covered by the individual accounts and 2) whether the spouses will contribute/get equal money or as a percentage of income. The conundrum of where to draw the line between what should come from individual money and what should come from joint money is the main reason Kyle and I haven’t slid toward the joint with allowances system. I’ve talked with people who have money management systems that are more complex than the ones I’ve outlined here, or even asymmetric like one income goes to a joint account and one goes to an individual account. Those kinds of systems strike me as very strange; it seems to me that those systems arise from artifacts of previous systems and there has not yet been a complete transition. I think that these couples should work toward a rationally designed money management system and revamp their account structure. Either that or I’m way more concerned about fairness than these couples! Do you disagree with any of my visualizations? What kind of money management system do you practice with your SO – does it fit neatly into one of these categories or is it a variation? Why do you think some people have complex or asymmetric money management systems? 30 Responses to "Money Management Systems Visualized"
I think that your visualizations cover the main models of how two people could combine their finances. I know which model I would hope to have (#1), but I have no idea which one I’ll eventually wind up with (#2 or 3). Probably depends how closely aligned I am with my SO regarding long term and short term financial decisions. I think being closely aligned on financial decisions is a prerequisite for marriage! Best of luck finding (or molding) that person. I really see my situation as a variation of the partly joint-partly separate system. Only a portion of my income (plus all of my online income) goes into an individual account. That money is used to pay bills and online expenses like hosting & domain fees. The rest goes into a joint savings. I’d say this isn’t so much an artifact of a previous system as an artifact of our income generation. I was out of work for 8 months after we got married, then worked 4 before being out of work for another 8. As such, we’ve always tried to rely on my wife’s income as much as possible. So that goes into the checking account. Meanwhile, what we couldn’t afford in a budget of just my wife’s income in those early days was payments on my debts. So I wound up paying them separately with whatever money I could hustle up from donating blood plasma, Craigslist gigs, and, finally, employment. As my income went up, we had money we could put into savings, so the rest of my income goes there. Haha, I remembered you guys had some kind of asymmetric arrangement but I couldn’t remember exactly what. But you’re not the only ones! 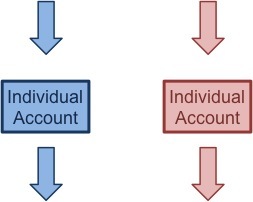 Would you consider your individual account a business account rather than personal? I think if that’s the case I think you’re more aligned with the joint model. I think there’s still a way to be joint with your various sources of income, but it depends on how you want to do your budgeting and obviously if that’s not a goal for you it’s not a goal! Almost completly joint. There is a small earmark of spending allowance that goes to me and my wife each month that can be spent on anything. It does require communication and aggrement on priorities, but I personally fail to see what that isn’t assumed rather than avoided in a marriage. That’s a good way of putting it and I agree! 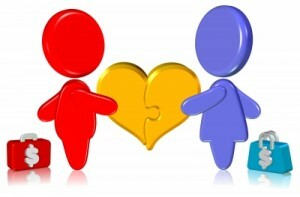 We believe that married people should be much closer to the unity side of the spectrum on a variety of issues/practices. My girlfriend and I use a completely joint account system. Initially we had completely separate accounts, but once we moved in together the hassle of having separate accounts but joint expenses pushed us to have a joint account just for bills (we each got paid in separate accounts, and used the joint account to pay joint expenses). Now we just keep everything in one account. Since we both agreed to have me in charge of maintaining most of our budget, it was easier to be able to see everything in one place. The academic term for that is the ‘whole wage’ system, actually – when one person manages all the money, no matter who earns it. Sounds like you guys went through a progression there – not many people transition their finances so many times! We are 100% joint with everything, though technically our requirement accounts are individual since they are required to be by the govt. =). 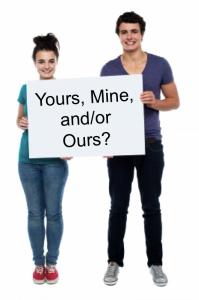 I jokingly refer to it as the “what’s yours is mine and what’s mine is mine” system. For us it’s a big part of working years the same goals and being all in on them together. Mrs PoP @ Planting Our Pennies recently posted..Can I Get Rich By Sharing My Stuff? I have a post in the works on the differences between how we think of accounts and how they are actually named/legally. Our IRAs are the big ones in our accounts galaxy that we think of one way (joint) but are actually another (individual). I always love visualizations. These cover the extent of how most couples pool or split up money. Nice work Emily. My wife and I are separate accounts with joint account. It works very well for us and I don’t think we will change it anytime soon. Thank you! Did I capture your account structure/flow in the partial pooling diagram or do you do something slightly different? We’re a single-income family so none of the above charts really describe us right now. When we were both working, everything was separate. I think that we’ll have separate accounts for a very long time. Once we pay off our student loans (and God willing, this won’t need to happen sooner than that) we will be supporting L’s parents financially as much as we’re able. So I imagine that I will manage our household/couple accounts, and he’ll have an individual account connected to his parents’ finances. It sounds like your plan for your future accounts wouldn’t fit neatly into my diagrams. But why couldn’t you have fully joint finances and transfer money to L’s parents from your shared account? To be blunt, I don’t trust his siblings. I want to keep my/our money an extra step removed from them. Does that mean his name won’t be on your “joint” accounts? Maybe I’m naive but I don’t really understand how his siblings could get to money that’s in his name. Or are you planning on adding his name to his parents’ accounts?? First off, I love the graphics. Secondly, I’d be pretty freaked out if I ever get into a relationship where we pool our money. I guess the point is that you just need to truly trust that with person with you whole heart, otherwise I could see a lot of hurt feelings about not working towards the same financial goals. That’s why we didn’t/wouldn’t share any money before we were married. 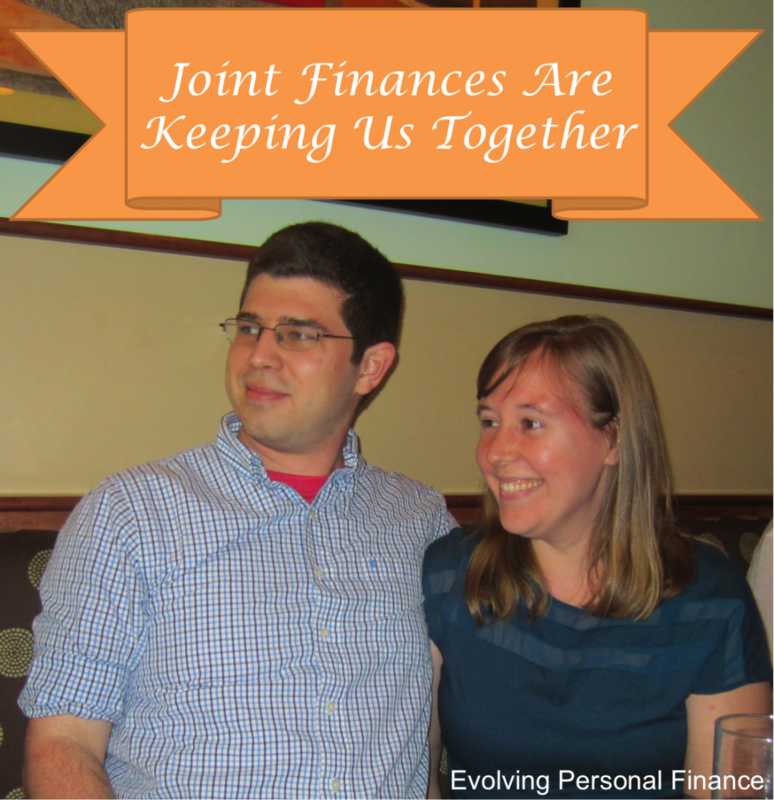 After we entered into the lifelong convenant of marriage, sharing finances was sort of a minor afterthought (and you KNOW how much we care about finances!). I would say we’re closest to the ‘Partly joint and partly separate money management’ system. Where we differ is that we don’t have a ‘joint’ account in name as such – he transfers money from his account to my account, from which I handle all our finances. He has an allowance, and I don’t (don’t want/need one). 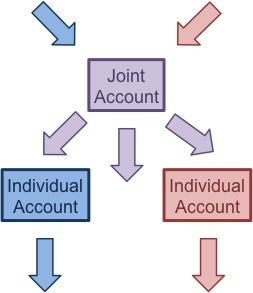 So your account doubles as the joint account and your individual account? Does he transfer his whole paycheck minus his allowance to your account or does he have some shared expenses he pays directly? I like your explanation of the various possibilities, and the graphics are very helpful. One thing that wasn’t mentioned, however, is that a lot of this really just applies to checking and savings accounts, as many investment accounts can’t really be joint. We combined our checking accounts to try to simplify administrative things for us, but we found that it didn’t make a whole lot of difference because we have so many other accounts. Each spouse can have a 401(k) plan, a rollover IRA, a regular IRA, a Roth IRA, etc! Plus you can have individual pension accounts, 529 (college) accounts for each child, etc. It all makes for a bothering amount of paperwork. 🙂 Still, we did find that having a joint checking account did save a small amount of work. I guess I didn’t get into the issue of forced-individual accounts because I have another post in the works on that very topic! I was trying to focus here on day-to-day money management and budgeting – presumably if you pool all your income you’ll at least think of your long-term individual savings as pooled, right? Is your spouse named as the primary beneficiary on all your individual accounts and vice versa? I’ll try to finish up that post soon so we can discuss it more!